Everyone has yeast that naturally lives on the skin, and sometimes that yeast can grow out of control and cause a rash. Tinea versicolor, a common rash-causing fungal infection, is an example of this. It is caused by a type of yeast fungus called Pityrosporum ovale and can affect people of any skin color though it is most common in teens and young adults. White, pink, red, or brown patches that are either darker or lighter than the skin around them. Spots that do not tan the way the rest of your skin does. Spots anywhere on your body. 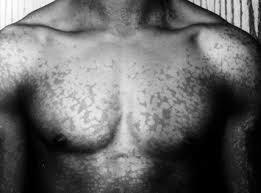 Because the yeast naturally occurs on your skin, tinea versicolor is not contagious and can usually be easily diagnosed and treated. Tinea versicolor is often diagnosed just by what the rash looks like but can also be diagnosed from a skin sample. Occasionally medical professionals will use an ultraviolet light that makes the affected areas appear a fluorescent yellow-green. Tinea versicolor can often be treated with over-the-counter antifungal treatments, but sometimes it requires prescription-strength medication. If your symptoms are not responding to over-the-counter treatments or the rash covers large areas of your body, it is time to visit your local FastMed Urgent Care. We’re open 365 days a year, and you don’t need an appointment to be seen.